I have successfully converted all of my cleaning products over to all natural recipes that I make myself. All of my cleaning supplies that is except for toilet bowl cleaner. I have still been using the kind that you have to worry about when your children use it because they could easily bleach the rug, their clothes, or burn their skin if it touches them. It was about time that I started using a Homemade Toilet Bowl Cleaner. I ran out of toilet bowl cleaner….then I forgot to buy some more…and forgot again…and, well, I will not go into what my toilets started looking like. So, I figured it was time to start experimenting and seeing what I like the best and what I thought works the best so I could finally stop buying and instead make a homemade toilet bowl cleaner. As you can see, I have a lot of ways that I love to use for natural cleaning methods. There are a number of recipes out there that call for 10 or more ingredients and a lot of prep work. As my name implies, I like things simple! I want the least amount of ingredients and prep work with the greatest results. It’s important to know how to take care of your toilet, therfore some testing is in order to make sure that this cleaner is healthy for your loo! Sprinkle all ingredients around the toilet bowl; vinegar first, then baking soda, then essential oils. Scrub and rinse by flushing. Sprinkle all ingredients around the toilet bowl; vinegar first, then borax, then essential oils. Sprinkle all ingredients around the toilet bowl. Sprinkle all ingredients around the toilet bowl; hydrogen peroxide first, then baking soda, then essential oils. Essential Oil: As far as using a few drops of essential oil: I love it! I used a few drops of lemon and it gave a beautiful smell to the toilet and bathroom. Wonderful. Ability to Stay Clean: All of the recipes work surprisingly well. Makes me wonder why I’ve been buying extra cleaners. You know as well as I that when you scrub with just a brush the toilet gets dirty again very quickly. 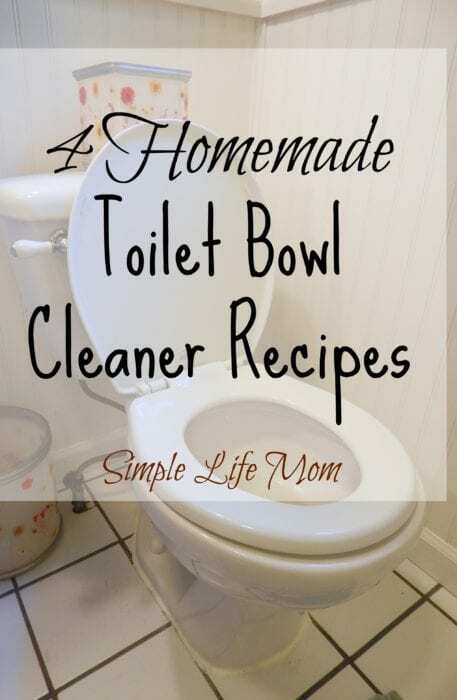 All of the recipes help to clean the toilet bowl and it stayed clean for the same amount of time as when I use a store bought toilet cleaner. Ease of Ingredients: I gave you approximate measurements so you’d have a general idea of what to use, but I merely sprinkled or dribbled in the ingredients and then scrubbed. It was no big deal and very quick to grab and do. All recipes were equal in this area. Frugality: All recipes are approximately the same price wise. If you were just buying for one recipe it would be about the same as another recipe. Safest Ingredients: The goal is to reduce toxic fumes and bleaching to skin, clothes, and rugs. All of these ingredients are a huge step up from using bleaches and other strong fume emitting chemicals. Because the citric acid that we buy is made from a mold that is fed gmo corn syrup. That mold is then filtered out to a high degree and then what we have left is a citric acid. I know a number of people who have allergic reactions to citric acid and (I’m guessing) it could be from residual mold. We have mold allergies, so I’d rather stay away from that unless buying one like This One. You don’t want to breathe in the powder of borax, but that’s with most powders. I don’t want to breathe in confectioners sugar either. No poisonous gases are produced. Just carbon dioxide and/or oxygen. Favorite Recipe: Hydrogen peroxide and baking soda is the winner for me. It took away the ring in the toilet easily and I was able to clean it beautifully and easily. I felt I had the most scrubbing to do with just the baking soda and vinegar, though it did stay clean afterwards (whereas just using the brush doesn’t keep it clean for more than a day) so it did still work. Though all recipes worked, I just felt that the easiest and fastest clean came from the hydrogen peroxide and baking soda recipe. Thank you so much! I, too, use no commercial products in use in my home. I make my own cleaners, beauty products and etc. I wish that someone would make a bath ( toilet and tub/shower) cleaner for use with wells that have hard water, scaling and mineral issues. These cleaners, although pretty good with city water, I’m sure, aren’t great for those of us with more difficult issue such as those mentioned above. I have tried them and they just don’t do it for my problems with well water. I have tried them using …well, no way around it, a metal brush attachment to a power drill!!! Still there are problems. My tub is an actual ceramic covered metal one, old, old old! So it can take the power drill option, but would love a recipe that won’t require so much “abuse”! I know there may not actually BE such a recipe, but I’d love help finding one! Thanks so much. Many of your recipes have residence in my recipes file with some modifications. Thanks for all of the hard work & research! WOW! That’s some serious mineral build up! I can’t think of anything that’s going to be as powerful as a metal brush and drill without being seriously caustic. I would look more into what I could do for the well. My parents had the issue and installed a water softening filtration in the house before it went through a lot of the pipes and into the tub, sinks, or toilets. I never tried making cleaning products before. These sound like they might work. Thanks for sharing. Have a terrific week! These are great! We’re starting to run low on what’s left of our toilet bowl cleaner. Like you, it has been one of the last things to switch over. I will have to give these a try and see how it goes! Thanks for sharing. I am still slowly changing over all my products, but getting there. These I will be pinning and trying. Thanks for sharing on Let’s Get Real Friday. I’m definitely going to try the mix of vinegar, baking soda, and oils. I threw out my Lysol toilet cleaner before I was able to find a non-toxic replacement for it, and I’ve struggled to find a good one. In the meantime, I’ve been pouring some vinegar into the toilet and scrubbing with that. Baking soda makes complete sense, and I really appreciate the direction on the order to add everything in. I think I’ll do lemon oil in with the mix. Hello. I just found this link and I am really enjoying it. The recipes are great. It seems like these recipes are for inside the toilet. Do you have a cleaner (preferably spray) for the outside of the toilet? Please help. Thank you.